A.C. Entertainment Technologies (AC-ET) Ltd will showcase a selection of the very latest lighting, audio, rigging and video solutions available from its vast portfolio of premium brands at PLASA 2013 (stand P40/P41). The stand will showcase the many marques which AC-ET distributes exclusively in the UK, as well as other leading brands the company is an authorised reseller for. From AC-ET's Lighting division, the stand will showcase their diverse portfolio of LED lighting solutions, including an exclusive unveiling of the new LED lighting family from Vision alongside the latest offerings from Chroma-Q, PixelRange, Spotlight, SGM, Philips Selecon and Mole Richardson. The Vision range also provides sole stand illumination of the Jack Goff Racing stand (Q50). Following AC-ET's recent appointment as European Master Distributor for the entire James Thomas Engineering lighting products range, the stand will showcase their existing range of generic lighting fixtures as well as their new retro-designed PATT 2013 softlight. 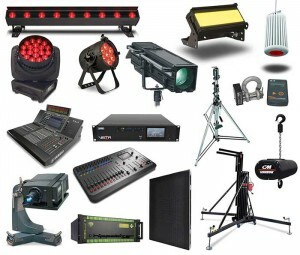 On the lighting control side, featured brands include the latest Jands lighting, media and LED control solutions alongside High End Systems' Hog 4 console range. The stand will also include a selection of professional lighting support and grip solutions from the expansive Manfrotto and Avenger range. From AC-ET's Audio division, the stand will provide hands-on demonstrations of the latest cutting-edge digital mixing console offerings from leading brands including Soundcraft, Yamaha and Allen & Heath. Also featured is the recently launched RCF active line array system and loudspeaker products from Nexo. Catch a demo of these innovations or come over to the stand and discuss the huge range of technologies and brands available from A.C. Audio to trade and end users. AC-ET's Rigging division will show in action the Kinesys DigiHoist programmable digital hoist system running the latest Vector software to control various CM Lodestar chain hoists. See the latest VMB innovations, including their new HDT-8 heavy-duty tower lift. On the trussing and staging side, displays from both Litec and Prolyte include the latest Litec trussing range and the Prolyte StageDex versatile staging system. Finally, the stand will feature a BroadWeigh full load monitoring system in use showing the latest 'Log 100', 100 channel software actively monitoring the mother grid over the AC-ET stand, with a GUI overlay of the structure showing stress changes during movement of the various fixtures. video content controlled by the latest Green Hippo Hippotizer media server software, pixel-mapped and projected onto various surfaces via the Christie Nitro integrated moving yokes and digital projector systems - providing a taste of the creative possibilities available with these technologies. In addition, the stand will utilise a LedGo high resolution LED video wall flown over the stand displaying various content to showcase the screens' impressive performance. AC-ET staff will be happy to discuss the company's exclusive show special offers and many value-added services - including used, clearance & eBay discounted stock, their Cable and Gel Express in-house manufacturing facility and emergency out of hours backup.